In chronological order - will the real National Cupcake Day please stand up? Well, Happy Birthday to you. My birthday is November 10th as well. love the list! is there a foodie calendar that lists all these days--that would be super fun! I really think Red Velvet should have it's own day too. I nominate March 12 - my birthday! The August cupcake holiday is actually Cupcake Day for the RSPCA and is celebrated by our friends down under: http://www.rspcacupcakeday.com.au. 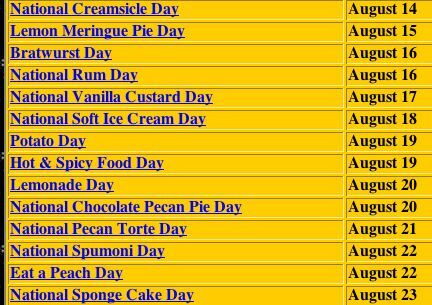 Just happened to stumble in while searching for the "official day" to celebrate National Cupcake Day. Your blog is delightful! I'm so glad I popped in. I hope you don't mind but I'm going to refer to your list often and add it to my ever growing list of food holidays. Thanks so much for sharing AND, Happy National Soft Ice Cream Day!!! Glad you posted this. I was confused about the dates too. We celebrate BOTH! Sounds logical, right? I've notice that different fun holidays have many different dates. We celebrate any we can on The Chocolate Cult if we can use them to indulge in our Sacred Substance which is, of course, chocolate in any form. Looks like even Martha Stewart is confused about the date. I got an email with the craft of the day and it implied it was National Cupcake day today. Oh, well. Never enough days to celebrate those little cuties, I say!